BRICS countries will definitely start using their local currencies for mutual settlements quite soon, the head of Russia’s VTB bank Andrey Kostin told RT Wednesday at the BRICS summit in Ufa. “We definitely see a growing interest from the countries to make settlements in local currencies,” the CEO of Russia’s second biggest bank said. 40-50 percent of all the mutual settlements among the BRICS countries can be performed in domestic currencies, Kostin estimated, RIA reported. The Chinese yuan as the leading currency can be used in settlements among BRICS member states, Kostin said, adding that the Russian ruble can be used for that as well. He says there will be a growing interest from leading Russian exporters to the process of switching to national currencies. The BRICS summit will give a boost to Russia-China relations, Kostin told RT. China is a leading nation and the largest economy among the BRICS countries and mutual projects like ‘Silk Road’ will definitely increase the cooperation between Russia and China economically, he added. 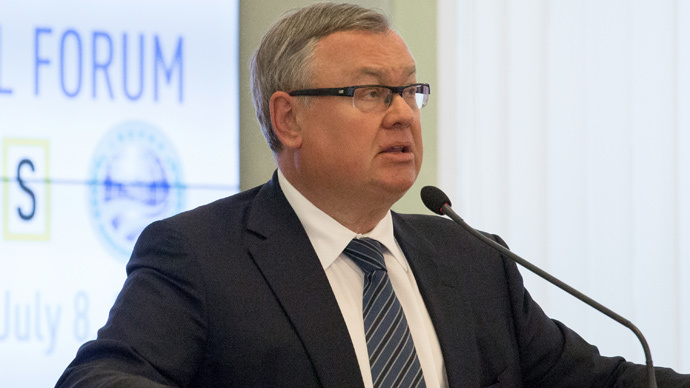 The creation of new institutions is quite important for the development of relations between BRICS members, Kostin said. Speaking about the BRICS bank, the VTB head stressed the importance of the “first institution created by BRICS countries.” The bank will “be at the heart of BRICS cooperation,“ and in a position to provide finance for important projects in Russia and in other countries, Kostin added. The New Development Bank will be a substantial player and might have an even more important role for Russia than the World Bank, according to the VTB head. “The World Bank is not lending money to Russia, and Russia is not borrowing from the World Bank. I think, Russia will be ready to borrow from the New Development Bank,” Kostin said. The BRICS agreement to forge ahead with a $100 billion New Development Bank (NDB) was signed last year in Brazil. The bank also possesses a reserve currency pool worth another $100 billion. The new bank will finance infrastructure projects in the BRICS countries and across other developing countries. NDB is expected to start functioning by the end of 2015, with its headquarters in Shanghai.